Dell’s known for making fantastic laptops, but the company, in the past, hasn’t exactly been known for its innovation. So the new Latitude 7285 2-in-1 feels like a pretty damn delightful departure for Dell, as it’s the first 2-in-1 to gleefully embrace wireless charging. Wireless charging has become increasingly common in phones, phone cases, and even wearables, but larger devices, like tablets and laptops, have failed to join in the love parade. That’s likely because you need a big honking pad to charge a big honking device, and, with the exception of one from Ikea, those pads tend to be really unattractive. The pad is enormous. The laptop is pretty tiny. The pad that charges the Latitude 7285 isn’t going to win any beauty contests, and you’ll need a lot of desk space for it. But it also has the potential to be wildly convenient, especially for people who tend to charge their device at their desk, but maybe do a lot of their computing on the move. Besides the wireless charging, and 2-in-1 tablet with detachable keyboard design, the Latitude 7285 will also include a Kaby Lake processor. 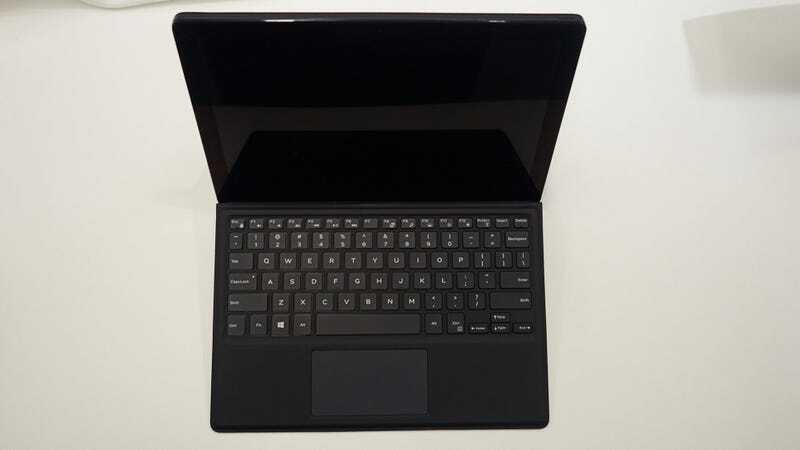 And Dell’s giving users a choice of keyboard too: either the Surface-style folio keyboard or a more traditional (and chunky) hard keyboard, which comes with a battery that Dell claims will get you another 4 hours life. The pad charges the Latitude 7285 through either keyboard, but not through the tablet section of the 2-in-1, so you can’t just toss the tablet on the giant pad and go. Witricity, the company behind the wireless charging tech, has been promising a wirelessly charged laptop since CES 2016, but the Latitude 7285 won’t be available until later this year, and Dell has yet to announce pricing. Still, wireless charging feels like an unrealized future at this point, so it’s nice to see a major manufacturer making strides towards that ideal.